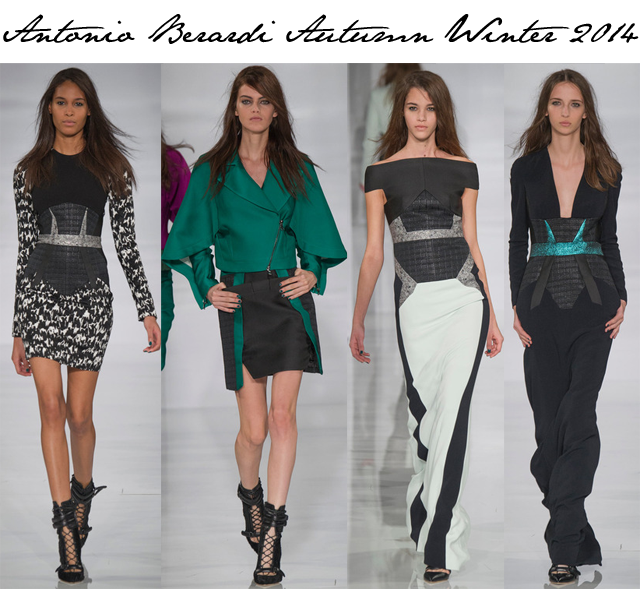 Antonio Berardi is presenting a more minimalist approach to autumn winter 2014, or so we were told in the press release. Apparently the designer is "shedding a concern for the elaborate." These were all words we read before the collection was showcased on the runway. As the first models made their way out, we could see that Berardi had definitely dropped the drama, however, he had kept hold of his unique ability to construct and shape with his garments. A new drama of sorts was created. The colours were deeper and richer. It all seemed quite dark and moody, minus a few beautiful and rich purples and greens. As far as making this more minimalist, all we could see for reduction was in the length of the hemlines. My goodness, ladies, if you are planning on sporting Berardi you best be hitting the gym now. Those are some short skirts.